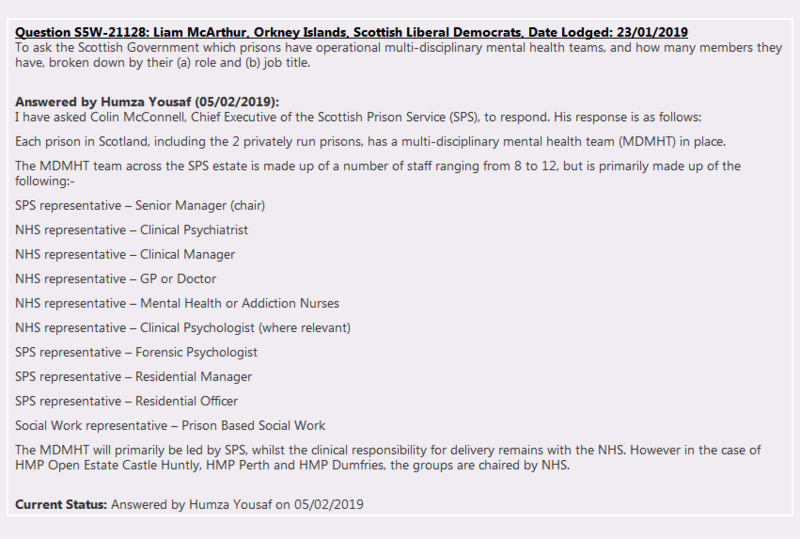 The standard way the BBC would use to report this would be: “Scottish Government denies claim that prisons have inadequate health personnel”. The substance of the actual report could be pretty much what has been presented here, but the headline would have been broadcast several times with no context. This is good – rehabilitation measures are the best thing fo society as a whole. And as you have already given us news before on how much more civilised the prison service is in Scotland in comparison the England – it sounds dreadful anything you hear about them in England and surely the human rights conventions are being abused daily – we can see that even some over subscription in some prisons do not cause riots here. There will be people that say that these people should be getting punished! Not more services and comforts! Of course, they are the same people that believe poor people are lazy, that homeless people are lazy, that people using food banks are just not trying hard enough, that they are alright Jack so who cares about anyone else (neoliberalism on skates) – ignoring the fact that it is *expensive* to be poor – everything costs more the poorer you are and the less you are paid, and there is no way out once you are stuck in the cycle if there are no opportunities or fair wages, they ignore the fact that most people using food banks are working. These are myths perpetrated by the neoliberal uk establishment to keep their money rolling in. There are some really nasty people in prison (and out of it), but it is likely not that large a proportion, and anything that can be done to help the other people back into being a functioning part of society is good. I am not in favour, particularly, of allowing prisoners to vote, their punishment is having their freedom taken away and being removed from society, but then, if it is a constitutional vote and they are only in prison for a couple of years,,,, maybe they should be allowed. That’s a human rights thing, not an EU thing, before anyone starts bleating on about how dare the eu interfere with our laws. Reflecting on the differences in prison services north and south of the border (funny how britnats still use this term too, accepting that there is a border, but not always accepting Scotland is a distinct country), I think I realise why I found the body language strange in the UN discussion of Scotland’s human rights agenda (posted in the previous article – if John gets round to moderating the comment…) – I realise there was a TOTAL avoidance of mention of all the English abuses of human rights – the UN human rights committee have slammed the uk gov’t on numerous occasions now regarding human rights abuses particularly on disabled people – but during this discussion there was NO mention of uk gov’t policy. Interesting. So they skirted round these issues, and perhaps Nicola Sturgeon was told not to mention them (she did not mention the prison services, and only briefly touched on how we have some control of social security, no mention of mitigating welfare cuts as far as I remember, etc). The UN asked what might Scotland do to influence the UK to adopt the European convention on human rights into statute – bugger all was the effective answer (I’m paraphrasing) -Nicola Sturgeon just veered the answers to saying that we are starting the process of embedding human rights into Scottish law. I cannot believe I didn’t notice this big blank space of avoiding mentioning England’s huge black hole of human rights issues – and I wonder how much the UN have tried to get the UK authorities – they are the member state after all – to participate and have had to engage with one of the UK member states instead (which they must find weird, and only had half an understanding of our independent judiciary system – but does that not make it more weird that our first minister did not mention how much we are doing in prisons?). The UN must desperately want the UK to participate, and trying to influence them via Scotland I suspect. Fat chance. Well, looks like Scotland will be accepted into the EU AND the UN without any trouble, the UK authorities have been so determined to make themselves despised by other countries that in fact Scotland is looking like it has a glowing halo and is a desirable buddy to have.